The chairman of Belfast Telegraph publisher Independent News & Media (INM) Leslie Buckley has stepped down from the board, ending a tumultuous period at the helm of the media company. Mr Buckley, who stepped down following an EGM yesterday, took on the chairmanship of the then dangerously indebted Irish media giant in 2012 after directors linked to former chief executive Tony O'Reilly were swept from the board. The company also publishes the Sunday Life, as well as Irish newspapers including the Irish Independent, Sunday Independent and Evening Herald. Four new non-executive directors, John Bateson, Fionnuala Duggan, Murdoch MacLennan and Seamus Taaffe, were approved by shareholders. The quartet were elected on the strength of votes cast in advance by shareholders. Mr Bateson is a nominee of Dermot Desmond, who owns 15% of INM, the second biggest stake. Each of the other three newcomers will serve as independent non-executive directors. The appointments were subject to ratification at yesterday's brief EGM. Mr Buckley said that while the five-and-a-half year period in which he had served as chairman had been a challenging one for the company, INM had seen "a significant positive turnaround" in its financial footing due, Mr Buckley said, to "the great efforts of everyone involved in the business". Mr Buckley thanked shareholders, current board colleagues, recent former board colleagues Jerome Kennedy and David Harrison, chief executive Michael Doorly and INM group editor in chief Stephen Rae. Allan Marshall, who was due to step down from the board alongside Mr Buckley, was unable to attend the EGM as he was grounded in London due to Storm Emma. 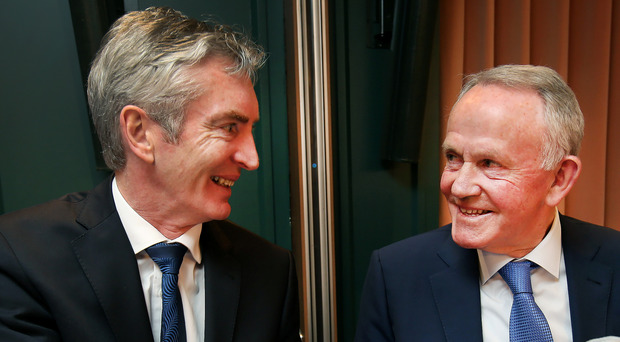 INM director Paul Connolly, who has emerged as a leading candidate to replace Mr Buckley as chairman, was also unable to attend due to weather-related travel restrictions. In his closing remarks, Mr Buckley paid tribute to INM's journalists whom, he said, provided full and fair quality coverage of news on a 24/7 basis across a series of iconic titles as well as online. Mr Buckley also paid tribute to other titles and journalists who had covered INM's travails in recent times. "As a high profile media company that prides itself on good reporting, we must also be cognisant that sometimes we, too, can become 'the news'," Mr Buckley told the EGM, which included a small group of shareholders. "To this end, I would like to further acknowledge the coverage of INM by other titles in print and broadcast, over the recent period. "While I might not have agreed with everything, I certainly respect and understand the value of a good exclusive and the questioning that goes with it. "It certainly hasn't been dull," he added. Mr Buckley said he was greatly encouraged by findings of an EY report which has recently been finalised after a comprehensive, four-month review of INM's operations, and will formally be presented to the board at its next meeting.